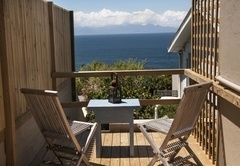 Seagetaway Cottage is a highly recommended property providing self catering in Simons Town for up to 5 guests visiting the False Bay region. 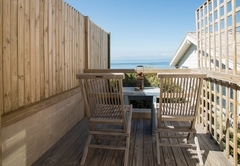 Seagetaway Cottage is a private two-bedroomed self catering cottage and is ideal for families, friends and couples looking for a seaside getaway. 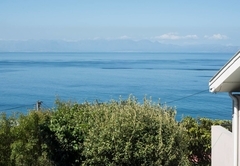 The property has spectacular sea views across False Bay, is a short walk from wonderful swimming beaches and provides a convenient base to visit the many local attractions. 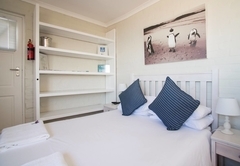 The cottage is decorated with relaxed nautical furnishings and photographs of African penguins taken at nearby Boulders Beach, a sheltered spot where you can swim with penguins! 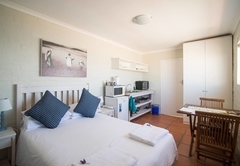 The two-bedroomed self catering cottage accommodates a maximum of 5 guests. 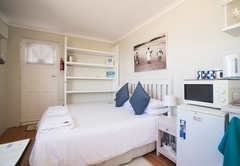 Both bedrooms have magnificent views of the sea. The main bedroom has a queen size bed and built in cupboards. 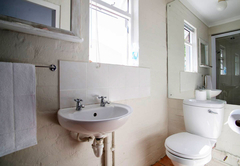 The en-suite bathroom has a shower and bath. 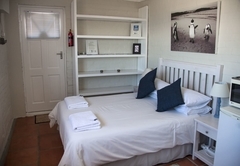 The second bedroom has two twin beds and built in cupboards. All beds are fitted with white percale linen. There is a separate guest toilet. Bath towels are provided. The open-plan living space includes the kitchen, lounge and dining area. 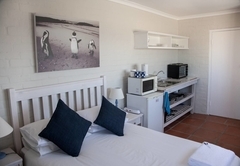 The lounge has two comfortable couches, a television, full DStv (satellite TV), a DVD and CD player as well as a sleeper couch and dining table. 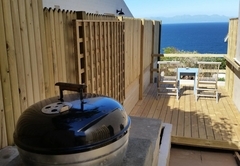 A sliding door leads onto a sheltered outside courtyard with a built in barbecue and more panoramic views across the bay. 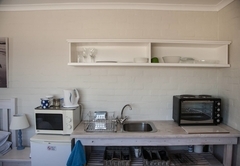 The modern kitchen opens onto the living area and has a granite breakfast counter with four comfortable bar stools. 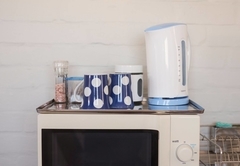 It is fully equipped and includes a microwave, oven, electric hob, cooking utensils, crockery, cutlery and glasses. Floors are tiled throughout. 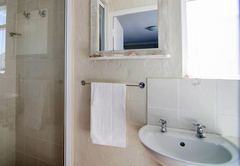 The cottage is located on a quiet street and has a sheltered courtyard and garden where you can sunbathe in private. The well-maintained indigenous garden attracts numerous birds. Guests are welcome to pick and use the variety of fresh herbs. Seagetaway Cottage has a single garage with an automatic door. There is parking for two more cars in the driveway. The house has flat access with no steps. The property has its own alarm. Free WiFi included. 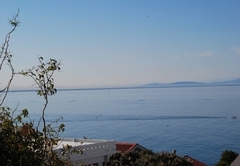 Simon’s Town is a picturesque beachside village overlooking False Bay just 45 minutes from the buzz of Cape Town and an hour from the Winelands. 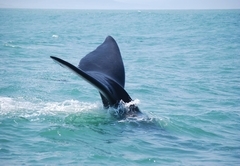 Activities in the area include the best-kept secret beaches, swimming with penguins, whale watching (June to November), white shark diving, sea kayaking, cycling, hiking and golf. Browse the eclectic mix of shops and explore the cobbled village lanes that reveal fascinating layers of history. 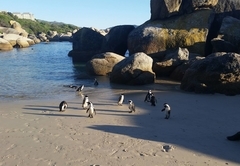 Boulders Beach African Penguin colony is a 5-minute walk from the Cottage and the Cape Point section of Table Mountain National Park is 8 km drive away. Response timeSeagetaway Cottage typically responds to requests in 5-10 minutes.